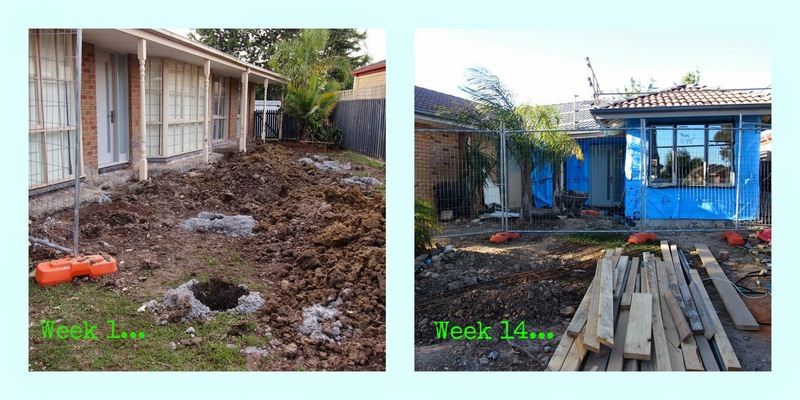 Project Extension: Weeks 10 to 15 - Are we done yet?! I know, long time no post when it comes my Project Extension updates. I love reading your blog and have enjoyed the updates on your extension. I notice that you haven't written about them for a while, you must almost be finished? Firstly thank you Sarah for the email (I love receiving messages and emails from you guys!). You would be absolutely right to assume that given we started this old extension way back in July that we should be finished... But Sarah, sadly this couldn't be further from the truth. You see up until last week, the builders hadn't done a whole lot since my last update 4 whole weeks ago. We had the roof tiles finally put on - and after weeks of trying to keep rain and water out of our exposed roof - this couldn't have come a moment too soon. Last week was a bit more of a bumper week - we had most of the guttering put up, our windows finally arrived (the builder realised they hadn't ordered a few weeks ago and of course there were delays) some of the internal plastering started and the house was 'wrapped' - whatever that means. As you can see from the below, the extension is actually starting to look like a proper little house now! Next week is supposed to be another biggie with the rest of the guttering completed (on the older parts of the house), the bricks getting done, the internal plastering and the roof tiles getting completed. But these days I try not to get my hopes up too much, because after weeks and weeks of frustration, no work being done and endless delays, I am trying to hang in there and finally see that the end could be near. We are all sleeping in Mr B's room and the novelty of 'camping' it out is starting to wear a little thin. What do you guys think so far?! Next week I hope to share some internal shots - exciting!! Well it is moving faster than our place so be encouraged that it is normal. Looks good now though. It is so much of a relief once that roof is on huh.